You know when you start watching things on YouTube you sometimes end up somewhere completely off topic and you can’t resist…. well a while ago starting with watching Andrew Ditton… I ended up watching some videos from a site called Anton’s Camping. Now my Danish is not good I have to admit, It is in fact abysmal. I have mastered “OK” and I think “Hello”… or “Hallo” (that might be Dutch?) but that is about it. Back to Anton…. he does do a good walk round of caravans we don’t generally see in the UK and one thing caught my attention on one of his walk rounds is the electrical and water connections to caravans. A Knaus in particular. One of the things on our list for a new caravan an internal fresh water tank. However, this Knaus takes it to the next level. Next to the water tank are the water drain valves and water inlet connection…..
…. and 230 volt electrical connection with a hole in the floor to pass the electrical cable and water connection through. Now for me this is a big improvement on having a locker that contains the battery and 16 amp connector, in which you always have to slightly force the hinge a bit when trying to shut the cover while your mains cable is dangling out of an under sized groove cut in the hatch door developing a permanent kink. Additionally the hassle of cleaning off the water connection under the plastic flap on the side of the caravan after you have just driven two hours down a rain-soaked motorway with all the road spray running down the side of the caravan and under the flap… then once connected, remembering you forgot to close the drain tap just as the call from inside the caravan goes out…… “Have you turned the water on yet?”… and you feet get wet again as the pump kicks in and a river of water cascades from underneath the caravan. This is on my “that’s a good idea” list and any caravan that does not have this setup is just not going to be MY perfect caravan. One thing that looking for a new caravan brought home is how they are all the same. Different manufacturer seems only to mean different cushions, everything else is nearly identical. I guess if all the manufacturers all use Alko chassis, same layout, cooker, loo, shower… all the windows and roof vents come from one supplier and internal fittings from another supplier then we are limited to what they can actually do. So it is down to the “that’s a good idea” things that are going to make the difference. 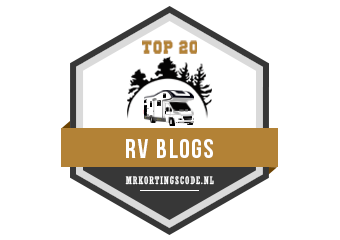 Now… Where was I going back at the start with the American RV stuff…. what you see on every American RV is a locker that houses all the water connections drain taps flush valves for their grey and black tanks… heck most have lights and heaters installed for winter use. Maybe looking across the pond or down under to ‘Straliah’ to see if there is anything that can be used to move our caravans (and motorhomes) forward design wise. This is not always a good thing however. It was obvious that someone from Swift had been watching too many RV videos where manufacturers had installed a mahoosive TV on the outside of a motorhome and rushed into the next design meeting slightly red-eyed with all the late night YouTube viewing doing an impression of Michael Caine… “Hang on lads… I’ve got an idea…..” which resulted in, in my personal opinion, that useless ‘pull out swing arm tv mount in a locker’ waste of space on the side of their caravans. Bailey seem to be the only manufacturer thinking outside the box on design… getting without the front locker and putting the gas bottle in a side locker close to the axle. Even dropping the battery into the floor (spare wheel in a recess in the floor would be great too!) Maybe they might want to look at reducing the clutter and having one locker just for the water and electrical connections… and maybe towards the rear so we can use shorter cables and water hoses on serviced pitches. Anyhoo, if you want to watch some of Anton’s Camping videos you can do at the link above, or for the video of the Knaus I’ve taken the still shots from is below. Keep a look out for the natty umbrella holder (although it might be a baguette holder!) and possible the best door bin replacement idea yet! You are so right about caravan manufacturers using the same components and I reckon that none of them have ever spent anytime living in a caravan. You are so right about caravan manufacturers using the same components and I often wonder if any of them have actually spent any time living in the caravans they make. Gas bottles above the axle and spare wheels in a floor recess were available some 10-15 years ago on Avondale caravans (If I remember correctly). Baileys problems are those of quality control and the use of poor quality fittings etc and loss of useful facilities e.g. onboard water storage tanks on single axle Unicorns to name but one of many ”reductions”. We in UK suffer from a lack of payload capacity as manufacturers trim “excess weight” (=useful facilities) from their vans. It is time they supplied new caravans with batteries and motor movers fitted as part of the basic payload of the caravan. As mentioned above I do often wonder if caravan designers actually use caravans regularly and they are frightened to think outside the box and be innovative. I’m fed up of caravans all having the same layout just different colour ways. Must agree with RWR that manufacturers should consider fitting motor movers as standard equipment; when you walk around a busy site and look at the vans the greater percentage appear to be fitted with movers. I’ve never really thought about motor movers in all honesty. I guess that only having a 7 metre single axle caravan has meant we never really needed one. Although that might change as the next caravan will probably be a slightly longer twin axle. One thing I have been looking into is electric brakes. Having towed trailers fitted with them and a suitable brake controller in the tow vehicle, I can’t understand why they have never been produced in the UK/Europe. I know in Australia virtually the same chassis and axle unit from Alko has them on the larger units… or it is an option and I believe it still has the over-run function so would be legal in Europe. Now if electric brakes were an option on a caravan… I’d certainly pay for that! Unfortunately, have to agree that the caravan designers and manufacturers should think about the people who are actually gonna use the vehicle! Good article!